Posted March 22nd, 2019 by Wes DeKoninck in General News. Posted March 13th, 2019 by Wes DeKoninck in General News. Join us for our Think Spring! NIDIA membership meeting at 3:00PM on Thursday, April 11th. Thank you to Raytheon for once again hosting our meeting. Posted March 7th, 2019 by Wes DeKoninck in General News. 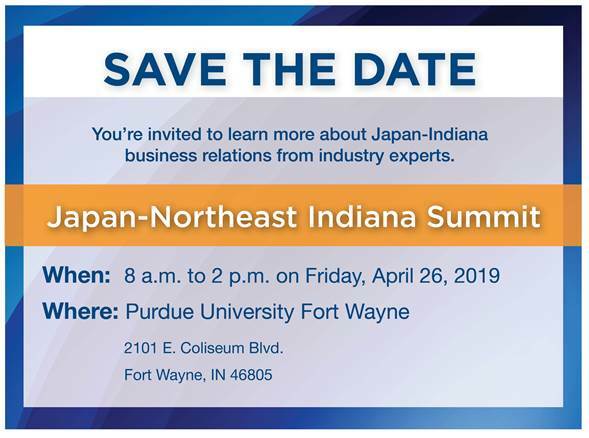 You’re invited to the 2019 Japan-Northeast Indiana Summit. Click Here for additional details and to download the request form. Posted February 26th, 2019 by Wes DeKoninck in General News. This event will introduce you to the resources Indiana has to offer specific to non-dilutive capital and local, state, and federal contracting. Join Kris Parmelee, Parmelee Consulting and Robert Warner, Northeast PTAC Counselor, to explore the ins and outs of the SBIR/STTR program and Government Contracting.